This week at A&P Preservation we're taking a look inside the A&P-turned-Superfresh in the Philadelphia suburb of Wynnewood, Pennsylvania. This store was subject to a Quick Looks post back in late January of this year. Similar to its sister store in Gladwyne, this store was a converted Centennial model, and was extensively remodeled in the late 90's. Let's take a look inside! Today's photos are courtesy of PlazaACME and Catnapped Retail Central. Note the "ENTER" and "EXIT" signs are left over from the 90's Foodmarket remodel. 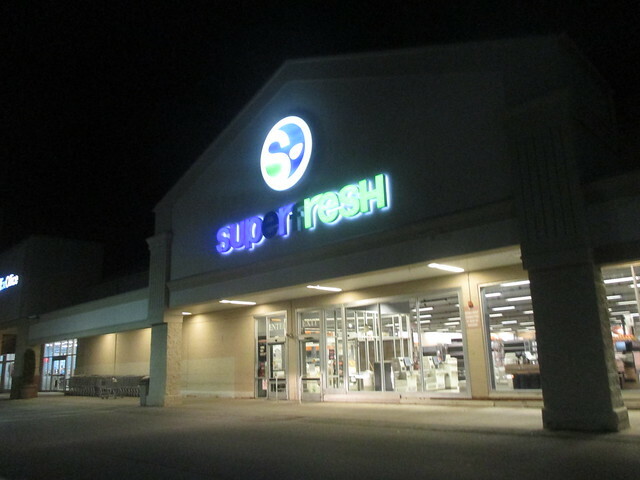 This store received an extensive "Fresh 3.0" model like many Philadelphia-area Superfresh stores from 2006-2009. However, Acme pulled out some of the key components of this remodel, including the wood beams across the ceiling, and spotlights. Obviously they're trying to brighten the place up! This store has a pretty normal 2000's store layout-- the "Fresh" wing, and the "Grocery" wing. Around the time of this remodel, both Superfresh and A&P's websites included these icons to coincide with their newly-remodeled stores. However, it turned out terrible. Click here to take a look. One thing that the Fresh 3.0 remodel focused on was the "Fresh" wing. Most deli departments were expanded to include many prepared food offerings. Notice how this particular deli almost spans the whole back of the store! As much as A&P prided themselves in fresh, it died out in the meat department. There is no service counter! One thing that changed in the Fresh 3.0 remodel was the fact that A&P removed their iconic wood-slat aisle toppers! I'm pretty sure A&P replaced the floors with this remodel in this store, too. The floors look amazingly pristine! I would say A&P has a nice bakery going here, but honestly I have to give kudos to Acme, who took over this store. The bakery looks amazing! There's obviously a great crew at this store. Nice layout, too! This decor reminds me of Acme's Premium Fresh & Healthy 1.0 Decor, which focuses on two things: department names, and a subliminal icon. This store tops out at 15 aisles, not bad for an expanded Centennial! The decor also died out here due to the low ceilings. Customer Services is in the front corner, pretty standard for any A&P remodeled or built after 1980. Interesting choice for the icon here, which is a person flipping over. I guess it has to do with the saying "We'll bend over backwards for you" ? A pretty cluttered front end, for sure. I'm not sure what time of day these pictures were taken by our contributors, but I hope this isn't the normal crowd this location draws!